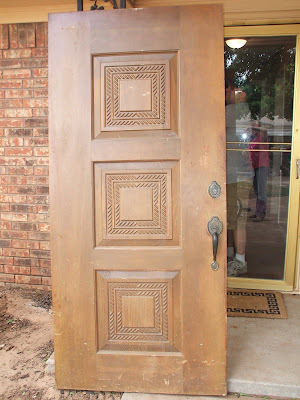 The old door we took out (you can see the old storm door behind it) That blasted storm door was my enemy. The latch always stuck so my kids could barely open it. My 4 year old would just sit there and ring the doorbell until someone came and half the time ended up waking up the baby. The main door made our hallway like a cave because no natural light came in. I told my husband the best Mother's Day gift would be a new door. He did it! 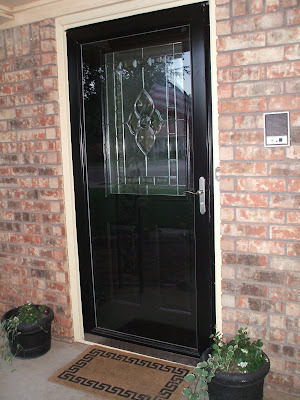 He took out the old door, storm door, and trim and installed new everything for my mother's day present. He is amazing~doors are not easy! I just got around to painting it. The reason my doors are never clean, but why the "view I love the most is my front porch looking in:"
that door looks awesome! I love it!!! Your door looks great! I am so impressed with your re-decorating skills...Great job!!!!!! The door looks great, Melissa! 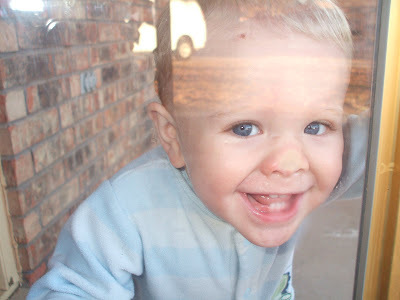 I havn't looked at your blog in forever and I love it - especially "the front porch looking in". What a cute picture of Spenc. We can't wait to see you guys (especially all those little ones) in just another week or so! The house is looking AMAZING! We are having a workshop on blogging and we looked at yours for an example! You are so cute!